Washington Challengers Cup in Tacoma was postponed from Dec. 20-21 until Dec. 27-28. Bill Schill defeated Mike MacGregor in a playoff. Congratulations! Schill is now seeded into the state championship in February. See the Tacoma Chess Club page for more about this and other events. Seattle Saturday Quads (Dec 13), Portland Winter Open (Dec 13-14), Seattle Sunday Tornado (Dec 14). 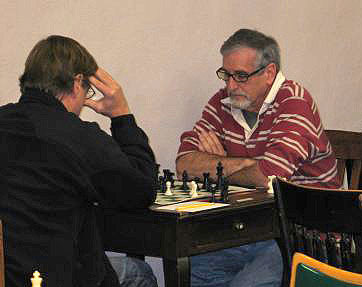 Photo: Mike Morris (right) competes at the Winter Open. The weather in Portland did in fact turn to severe winter conditions by Sunday, but we understand that the tournament did conclude on Sunday, with a few players missing!! See report on PCC web. See more of Rusty Miller's photos on Flickr. Portland CC Saturday Quads (12/6), Washington Quick Chess (G/30) Championship (12/6) in Seattle, Clash of the Titans (12/6-7) in Spokane. Congratulations to Quick Chess champion Fred Kleist, first among the 13 players who competed. Gary Dorfner was the TD for the event. Thanksgiving Holiday Weekend! – WA Class Championships (Nov 28-30) in Redmond, WA. Photo: WCF Treasurer Robert Allen. See more photos and results. Java Fusion Open (Nov 22), Tacoma, WA; Portland Chess Club Game in 60 (Nov 22), Portland, OR; Seattle Chess Club Sunday Tornado (Nov 23), Seattle, WA, Tacoma Chess Club All-Economy Tournament #3 (Nov 15-16). Congratulations to John Julian, winner of the recently completed Spokane Fall Championship (with 5 points), as well as the 5th Spokane G/10 held on Oct 25 (with an overwhelming 13.5/14 points)! Seattle Chess Club Saturday Quads (Nov 8), Seattle Chess Club Novice (Nov 9) and Seattle Chess Club Extravaganza (7 Round G/90) (Oct 31-Nov 2). Portland CC Game in 60 (Oct 25), Spokane G/10 (Oct 25), Tacoma Open (Oct 25-26), Seattle CC Sunday Tornado (Oct 26). The 26th annual Western States Open was contested in Reno, Nevada (Oct 17-19). For those staying closer to home, the Portland Fall Open was held the same weekend (Oct 18-19), and there was a G/15 tournament at the Miller Community Center in Seattle. Congratulations to Portland Fall Open winner Radu Roua, with a perfect 5 point score! Reserve section co-winners were up-and-coming junior players Austin Sharp and Alex Piatski, each with 4 points. Congratulations to Paul Bartron, winner of the Washington Senior Adult Championship (Oct 4) in Tacoma, WA. Also contested the same weekend was the new Seattle Chess Club Lo-Roller Octagonal (Oct 4) in Seattle, WA. Seattle Fall Open (Sep 26-28), Portland CC Game in 60 (Sep 27), Eastern Washington Open (Sep 27-28). Report! The Green Open (Sep 13-14) at Seattle CC – See report by Hanniegn Pitre. See games. See the Tacoma Chess Times for recent club tournament results. Oregon Open (Aug 30-Sep 1) in Gresham, OR. As reported by TD Neil Dale, "Bill Heywood is the winner of the 2008 Oregon Open. He finished clear first, with four wins and two draws (against Corey Russell and Andy May). Tied for 2nd through 4th with 4 1/2 points each were Russell, May and Alex Guo." Anthony Guo was the Reserve Section winner with an excellent score of 5.5 out of 6. See the Portland Chess Club website for more info. Portland CC Game in 60 (Aug 23), Summer Lightning in Spokane (Aug 23), Tacoma Summer Open (Aug 23-24), Seattle Seafair Open (Aug 15-17). See games from Seafair Open. Washington State Blitz Championships (Aug 9) in Bellevue, WA. Congratulations to teenager Michael Lee, who won the championship with 10 out of 14 possible points! WA wins Match! A Washington vs. Oregon chess match was held Saturday, July 26 in Hoquiam, WA. See the roster of players and a brief report with photos and games. Congratulations to the Washington team, winning the match by a score of 6.5-3.5. Puget Sound Open in Tacoma, WA (Jul 19-20). Portland Chess Club Summer Open (Jul 12-13) – Congratulations to GM Emil Anka, winner with a score of 4.5/5.0. His only draw was against NM Nick Raptis, who finished with a score of 3.5/5.0. David Bannon won the reserve section with a perfect 5.0 score! Spokane Falls Open (Jul 12-13). Evergreen Empire Open (June 28-29) in Tacoma. There were also one-day events the same weekend in Portland and Spokane. Emerald City Open in Seattle (June 20-22). OR Championship! – The Oregon Invitational Championship was contested June 13-15 and 21-22 in Portland. Radu Roua won the event 7-2 to repeat his victory of 2007. Landon Brownell and Nick Raptis tied for 2nd-3rd with 6.5-2.5. Please see the Portland Chess Club website for more information and results! Rusty Miller reports on the Portland G/60 (May 31) – "22 players took part in the event held at the Portland Chess Club. As usual Nick Raptis was number one rated and won the event 4-0. A number of the players were high school students and younger. Neil Dale was the TD. I played and did okay with 1 win 1 loss and 2 draws." Note: Nick also won the June G/60. WA Open games are available on the games page in Chessbase and PGN formats. Thanks to Drayton Harrison for compiling the available games. Games from the Washington Championship, Premier and Invitational are also available to download. Washington Open was held Memorial Day Weekend (May 24-26, Redmond, WA). Congratulations to the winners: Open - Ignacio Perez, Nick Raptis, Michael Lee, Charles Cadman, Mark Naus, Andy May (4.5/6.0), Premier - Arie Milner, Peter Lessler (5.0/6.0), Reserve - Daniel Copeland (5.5/6.0), Booster - Quentin Chi (5.5/6.0). 33rd Keres Memorial (May 16-19 in Vancouver, BC) – Eighteen juniors joined this 79-player event, organized and directed by Stephen Wright with assistance from Katherine Davies and Lyle Craver. In Open section, FM Bindi Cheng tied first with IM George Orlov with 5.5/7.0. See http://www.bjdy.com/juniorchess/news.html for more info. Inland Empire Open in Spokane (Apr 26-27) – Winner: Paul Bartron (4.5/5). "BC's chess parents and junior chess organizers congratulate WA organizers, coaches/teachers, parents, and particularly these young chess players for their success: 1,414 players at 2008 WA State Elementary Chess Championships!" (Apr 26 in Redmond, WA.) See http://www.bjdy.com/juniorchess/search/index3.html. Grandmaster and former US Chess Champion Hikaru Nakamura was at the championships, and was scheduled to take on a group of kids in a simultaneous exhibition! See his website, http://www.hikarunakamura.com/ for background info on Nakamura. Portland CC Game in 60 (Apr 26) – Winner: Nick Raptis (4/4). Clark Harmon Memorial Open in Portland (April 19-20). The winner was Radu Roua with 4.5 points, drawing IM John Donaldson in round 5. At 4-1 were John Donaldson, Nick Raptis, Steve Breckenridge and Michael Morris. There were 40 players. WA-BC International Scholastic Chess Match, Vancouver, BC, Canada (Apr 19). Congratulations to the BC team, winning by a score of 32-20 over the WA state team. See http://www.bjdy.com/juniorchess/news.html. See WA team photo album online. Congratulations to Idaho state champion Jason Evers, winner of the 2nd Alzheimer's Benefit Chess Tournament in Bend, OR (April 13) with a perfect 3 out of 3 score. Your business manager, Eric Holcomb, finished in second place after a tie-break. Also see Sean Tobin's blog at http://cocjournal.blogspot.com/. Daffodil Open was held in Tacoma (April 12-13). The winner was Mike Macgregor with 4.5 out of 5 points. There were 19 players, including some we hadn't seen in awhile! OSCF State Championship (K-12), Seaside OR (Apr 11-12). The third annual Oregon Scholastic Chess Federation State Championship was a huge success! See www.oscf.org. Seattle Spring Open (March 28-30). There was an excellent turnout of over 50! 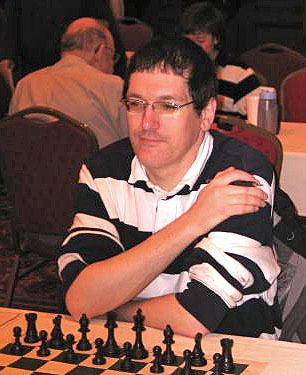 Congratulations to Larry Ball, winner of the Portland Chess Club March G/60, with a perfect score of 4 out of 4! 9th North American FIDE Invitational was held in Chicago, Illinois, March 22 to March 28. See http://www.nachess.org/fide and http://www.monroi.com/wdc. Report on the well-known “Amber Chess Tournament,” March 15-27 in Nice, where 12 grandmasters played the "two circles" system: one fast game and one blind game. Portland Spring Open (Mar 15-16) and Spokane Uncle's Tournament (Mar 15). All Economy! The Tacoma Chess Club experimented with an all-economy (no prize fund) tournament the weekend of March 8-9. There were 16 entries. 16th Dave Collyer Memorial, Spokane, WA (Feb 23-24). 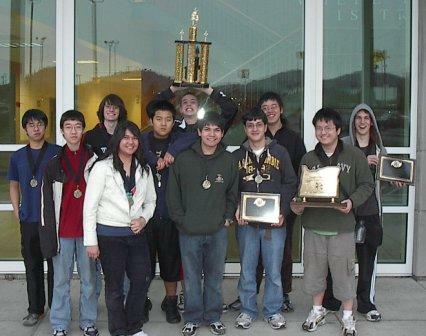 Oregon High School Chess Team Association (OHSCTA) reports on results of championship held February 22-23 in Roseburg. Photos: A scene of the action in the playing hall (left); Sunset high school Varsity and JV team that won two titles (right). New Champion! Washington State Chess Championship/Premier/Invitational concluded Monday, February 18 at the Seattle Chess Club. Congratulations to GM Gregory Serper, our new Washington State chess champion!! It was an exciting final game as defending champion NM Ignacio Perez tried an exchange sacrifice against Serper, but the GM met the challenge!! Interesting! – Player "Blurbs" – Hear how the players got started in chess. Woodpusher! Meanwhile your business manager, Eric Holcomb, won the "Washington Woodpushers" under 1800 tournament in Tacoma with a score of 3.5 out of 4. This event was incorrectly advertised in Northwest Chess with February 17-18 dates (instead of Feb. 9-10). Updated! Games from some WCF events, including the 2007 WA Class Championships and the 2007 WA Challengers Cup. Games are available in Chessbase and PGN formats. President’s Congress was held at the Tacoma Chess Club. Nathan Lee won the WA Junior Open on Jan 21, 2008 after winning 2 playoff matches following a 3 way tie for 1st place. Nathan gets seeded into the WA Junior Closed and the WA Premier next year. We had 176 players for the largest turnout seen yet by WCF scholastic director David Hendricks. Thanks for your participation! Seattle City Championship at the Seattle Chess Club (Jan 18-20). The 11 player top section was won by Dereque Kelley 4.5/5.0. In second place was Elston Cloy at 4-1. The 17 player reserve section was won by Drayton Harrison. Portland Chess Club Gresham Open (Jan 5-6). Rusty Miller reports, "Paul Barton won with 4.5. Nick Raptis, Radu Roua, Andy May, Pablo Pena, Howard Chen, and Ethan Peake all finished with 4 points. 46 players took part. The playing site is one of the best in the NW!" By the way, Rusty has moved to Camas, WA near Portland.